Last night, I attended a meeting set up by Toronto Hydro about their future plans to build a wind farm in lake Ontario along the Scarborough bluffs approximately 2 km from shore. They would stretch approximately 24km, from Ajax to the Leslie Street Spit. They expect to have 60 turbines, I believe in rows 3 deep. They’re only in the preliminary stages, and plan to test the offshore wind first. Their plan is to build at anemometer to measure wind speed for two years, before deciding whether the wind farm is feasible. The anemometer will be placed in the lake across from my neighbourhood, Guildwood. Therefore, the meeting was scheduled in the auditorium of the local high school. An earlier meeting was located in a small church basement, which soon filled to capacity, and with a line of people still standing outside, Toronto Hydro wisely decided to reschedule the meeting to a larger venue. Most of the people I spoke to in line were opposed to the idea of the wind farm. I could tell that emotions were high, and I was sad to say, conspiracy theories abounded. People were handing out leaflets that described the horrors of living near a wind farm: health dangers, property values would drop, etc. I wasn’t impressed. But before I proceed, I had better state my views. I was shocked when I heard about the wind farm. Many of us who live near the bluffs are emotionally attached to them. 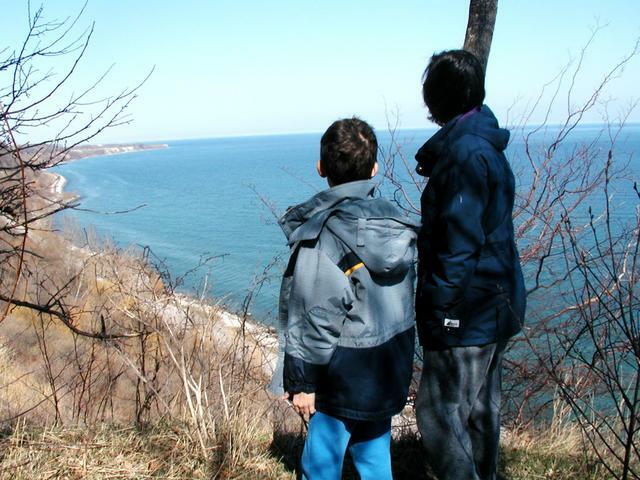 Scarborough is often unjustly maligned, and those bluffs make up for it a little bit. The view across the lake is stunning – the wide expanse of the lake, be it a sunny, shiny blue or a cloudy slate gray is a sight to be seen. And although I love the look of wind turbines, there’s something stately and elegant about them, I could not imagine a wall of them running across the entire view. Those of us who live in the Guild know what I’m talking about. Here are a couple of my “sigh” moments: At the top of Guildwood Parkway near Kingston Rd, just before you descend into the neighbourhood, you catch a glimpse of the lake over the trees. Ahhh. Why travel home along ugly, busy Kingston road, when you can travel south along Morningside. When you reach the end and turn along Guildwood parkway, there’s the lake. Majestic. Ahhh. I thought to myself: please, put a wind turbine in my back yard. But please, please, don’t spoil the lake. I felt a little guilty. After all, I’m talking about aesthetics here. Perhaps I was being shallow. Still, in my gut, I couldn’t help but feel it was wrong. Reid disagreed with me. He thought it would be cool to have them in the lake. By the time I got to the meeting last night, as I told Tim, an acquaintance I met there, I was wavering. At the meeting, Toronto Hydro gave an overview of their project. I liked their presentation – they were well prepared, and dispelled a few myths. They made it clear that they wanted to make the meeting about the anemometer, as there is no decision yet on whether to proceed with the wind farm (in fact, they would require a full Environmental assessment before they could proceed with that). But they were dreaming, the meeting would of course be about the potential wind farm. Their presentation was brief (about 40 minutes) and then they opened the floor to questions. They were smart: they brought a facilitator who laid the ground rules: let a person speak, no interruptions, etc. The crowd ignored it, for the most part. You could feel the tension in the air. (I called Reid and told him I wasn’t sure I’d get out of the room alive.) But the facilitator was crucial – I think he prevented bloodshed. Those who wanted to ask questions had to line up behind two microphones. What seemed like half the room emptied as people scrambled for the microphones. As the questions (or rather comments) proceeded, I became a little shocked. Representative after representative of pro wind farm environmental groups gave their comments. Most were passionate pleas for clean energy, and how we could not wait – we needed more wind farms now! But I was concerned: after about 20 representatives spoke, where was the other view? Where were the residents? I saw our councillor, Paul Ainslie, join the line up right away, but he ended up nearer the back of the line. It took him until after 10pm, over 2 hours, to get to the microphone. Our local MPP, Margaret Best came as well. She took the vacant seat next to me (after a resident left in disgust, as many residents did). I don’t think she was impressed. There was no way for her to get to a microphone. – One gentleman asked, why is Toronto Hydro pursuing a wind farm project? Toronto is a very populated area with very little place to put such a wind farm, whereas Ontario is huge with lots of room! We could likely place a wind farm onshore, which is cheaper, in places where there is much more wind. Isn’t Ontario Power Generation (formerly Ontario Hydro) the correct group to pursue wind farms? Shouldn’t we be leaving this to them? – A fellow came to the microphone and explained he worked in the financial industry. He managed a pension fund, and explained that before they ever undertook a large project, they would examine the financial viability to ensure it was profitable. Had Toronto Hydro done so? They said they had not. They would do so AFTER the test results were in. I couldn’t believe it!! – A couple of people (including Paul Ainslie) questioned Toronto Hydro’s interpretation of the Helimax report (A report for OPG that estimated wind strength and suggested the best place to build them.) Paul commented that the report did not recommend the shore of Lake Ontario off the Scarborough Bluffs as an ideal location for building the wind farm. Nine of the recommended sites were within the Toronto Hydro jurisdiction, yet all 9 were ignored. He wanted to know why. I thought Toronto Hydro’s response was a weak one: because those locations weren’t exclusive to Toronto Hydro; others could develop them. – A few people questioned the waterfront revitalization project. In fact, mayor David Miller was elected on that platform. Doesn’t building an industrial facility, like a wind farm, fly in the face of that? An impassioned woman, who was part of the West Rouge waterfront revitalization project, said she had worked for years with the group responsible for cleaning up their shoreline, putting in pathways so that the lake could be enjoyed by all. They completed it recently, and now fear it will be turned into an industrialized site. – I was moved by the comments an oriental woman, who moved to Guildwood last summer. She explained that she came to Canada 21 years ago. The first place they brought her to was to Guildwood, to see the view of the lake. (She told us that we didn’t realize how popular this area was with Oriental visitors. ) She was determined, she said, to have a home in Guildwood. She worked for 21 years before she could afford it. Having been born in Canada, we don’t realize what we have here. She compared Canada to China, where there are so many people, there is no way one could have such an unspoiled view. She told us we would be losing something precious. – One of our residents expressed a concern over the Guild Inn property. This phenomenal piece of property, with its important history, has been left in a state of decay while the City of Toronto decides what to do with it. The community has followed this project over the years, and we’ve been disappointed repeatedly as various plans fall through. Most recently, the city has been working with Centennial College to build their Cultural and Heritage institute, a restaurant, a boutique room hotel and a conference center. The resident expressed concern that Centennial may pull out given that the view of the lake, a draw for visitors of the hotel, may be so radically changed. I left the meeting feeling, again, that the bluffs are the wrong place to build a windfarm. But it’s probably best to let Toronto Hydro build their anemometer and test the wind speed. Perhaps then they’d actually do an economic feasibility study as well, and determine whether or not it’s viable. Reid made an excellent point when I got home: we should have an artist rendition of what a view from the bluffs would like like with a wind farm there. Given that they are 2 km out from shore, perhaps they would be tiny? I left him doing calculations to try and figure it out, but I don’t think he was confident in his figures. So, to anyone out there – how large would a wind turbine that’s 30 metres high look from a distance of 2 km, viewed from 50 to 60 metres high? So standing on the bluffs, the height of the windmills would be about the width of your finger held at arm’s length. The next thing to figure out is how close together would they be? We have 60 turbines, 3 deep over 24km. Each column of windmills being 3 deep, there are 20 columns over 24km, or one column every 1.2km. But how far apart are the windmills inside each column? Or are they really columns? Maybe they are — it would make maintenance a bit easier I guess. Finger width, eh? Or perhaps a bit bigger than the moon? That doesn’t seem too big. Still, wish we had an artist rendition. Sounds like a fun meeting. Don’t like the busing either. Can’t remember any windy days when I visit the area, unless the bluffs deflect them way over the houses in your neighbourhood. Like Reid’s finger calculations – he does have big hands and funny eyes though. Really surprised that Toronto Hydro would not do an economic study to evaluate the feasibility, and admit it, but then it’s only taxpayers money – even for the anemometer portion if they don’t continue with the project. Finally for your information, something most may not realize, the Province/taxpayer pays 11 cents per kilowatt for power from windfarms (see http://www.powerauthority.on.ca/sop/ – under “Wind Energy” check out “Standard Offer Program for Wind Energy” ) then collects in the 5.5 cents range from the consumers (check your electric bill for cost of power consumed) . The difference still has to be paid by someone (i.e. taxpayers). Guess we can consider it an environmental cost. As mom says – our job is to pay and shut up. Looking at you and Ronnie on the bluffs – what about a huge solar farm facing that great unblocked sun? Kidding aside, what about solar cells on everbody’s roof? Per link above, they pay 42 cents/kWh for solar energy. Compare this to the natural gas plant that the provincial govt just put up within two kilometres of our front door, with its carbon and stray chemical emissions and architecture inspired by the refinery you see in the opening seconds of “Blade Runner”. It is visible now any time we walk south from the Danforth, and yet not terribly noticeable. I’d gladly trade you for the non-emitting, poetic (to my mind) turbines. I suppose you do know there are 2 rather large wind-farms in Ontario already? “Why do people like western Art?” you could equivalently ask when it comes to windmills vs. dirt covered garbage dumps, I mean “Bluffer’s Park”, er Humber Bay park, er, Queen’s Quay, er, well I’m sure there’s a purely natural park in the city somewhere. Hm, Centennial park.. oh actually, that’s the biggest garbage dump that’s a park. Well anyway, I think they’re beautiful. Then there’s that unspoiled wilderness by the Reesor Road wrecking yard, I mean Beare road landfill, I mean The Zoo. Toronto is quite beautiful. Did I ever mention I *liked* things like Blade Runner, I mean Shinjuku, I mean Shibuya, I mean Dundas Square? Anyway art and beauty are a curious topic. If you’re wondering what my point was, don’t worry, I didn’t get it either.